Sara (Rozen) Hauptman was born on August 15, 1918 in Laskarzew, Poland but grew up in Brussels, Belgium with her parents, eight brothers, and two sisters. Sara married Nathan Hauptman in 1938 and had her son Guy in 1939. After the Nazis invaded Belgium, Nathan was arrested, and Sara sent Guy and her baby Monique into hiding with Christian families. 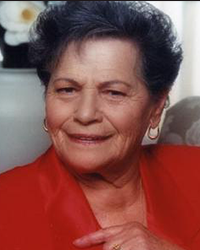 Sara worked in the resistance until her arrest and deportation to Auschwitz. She was then sent to Dachau and was liberated by the American Army in 1945. Sara was reunited with Nathan and her children. They moved to Germany in 1947 then immigrated to the United States.